LOS ANGELES–(BUSINESS WIRE)–California Resources Corporation (NYSE:CRC), an independent California-based oil and gas exploration and production company, today reported net income attributable to common stock (CRC net income) of $66 million, or $1.32 per diluted share, for the third quarter of 2018. Adjusted net income1 for the third quarter of 2018 was $41 million, or $0.81 per diluted share. For the third quarter of 2018, CRC net income was $66 million, or $1.32 per diluted share, while adjusted net income1 was $41 million, or $0.81 per diluted share. Adjusted net income1 excluded $28 million of non-cash derivative gains, a $3 million gain on asset divestitures, a net gain of $2 million on debt repurchases and a net $8 million charge related to other unusual and infrequent items. These results compared to a net loss of $133 million, or $3.11 per diluted share, and an adjusted net loss of $52 million, or $1.22 per diluted share, in the same prior year period. The 2018 results reflected higher production, significantly higher realized commodity prices and higher gas trading income, partially offset by higher production costs and general and administrative (G&A) expenses. Total daily production volumes averaged 136,000 barrels of oil equivalent (BOE) per day for the third quarter of 2018, compared to 128,000 BOE per day for the same period in 2017, an increase of more than 6 percent over the prior year period, largely driven by the Elk Hills acquisition. This net increase included a 1,300 BOE per day negative effect on production volumes from production sharing contracts (PSC). For the third quarter of 2018 oil volumes averaged 84,000 barrels per day, NGL volumes averaged 17,000 barrels per day and gas volumes averaged 208,000 thousand cubic feet (MCF) per day. Realized crude oil prices, including the effect of settled hedges, increased by $13.61 per barrel in the third quarter of 2018 to $63.63 per barrel from the comparable prior year period. Settled hedges decreased realized crude oil prices by $10.10 per barrel in the third quarter of 2018. Average realized NGL prices continued to be strong and registered $45.72 per barrel, reflecting a realized price that was 60 percent of Brent prices. Realized natural gas prices were $3.16 per MCF in the third quarter of 2018, $0.60 higher than in the same prior year period and $0.91 higher than in the second quarter of 2018. The increase in realized gas prices is largely due to higher price realizations resulting from limited third-party storage, pipeline constraints and seasonality trends. Production costs for the third quarter of 2018 were $236 million compared to $222 million in the third quarter of 2017, an increase of $14 million primarily due to $12 million from the Elk Hills acquisition and increased equity compensation expense of $2 million primarily resulting from the Company’s higher stock price. On a per unit basis, third quarter of 2018 production costs were $18.92 per BOE compared to $18.90 per BOE in the comparable prior year period. Third quarter of 2018 unit production costs were below the midpoint of previously disclosed guidance and would have been $18.68 per BOE excluding equity compensation expense of $0.24 per BOE. In line with industry practice for companies operating under PSCs, CRC reports gross field operating costs but only the Company’s share of production volumes, which can result in higher production costs per barrel. Excluding this PSC effect, per unit production costs1 for the third quarter of 2018 would have been $17.55 per BOE. General and administrative expenses of $81 million for the third quarter of 2018 were $20 million higher than the comparable prior year period primarily related to higher equity compensation expense of $9 million as a result of CRC’s increased stock price and additional G&A of $3 million as a result of the Elk Hills acquisition. The remaining increase in G&A expenses was the result of a number of smaller increases in various cost categories. CRC reported taxes other than on income of $45 million, $6 million higher than the same prior year period largely due to higher property taxes as a result of commodity price increases. Exploration expense was $4 million for the third quarter of 2018, $1 million lower than the comparable prior year period. Capital investment in the third quarter of 2018 totaled $158 million, excluding JV capital. Approximately $136 million was directed to drilling and capital workovers. 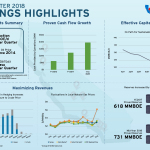 Cash provided by operating activities was $159 million, which included interest payments of $69 million. CRC’s free cash flow1, excluding BSP funded capital of $19 million, was $1 million in the third quarter of 2018. For the first nine months of 2018, CRC net loss was $18 million, or $0.38 per diluted share, compared to net loss of $128 million, or $3.01 per diluted share, for the same period of 2017. The 2018 results reflected significantly higher realized oil and NGL prices, partially offset by higher production costs and higher G&A expense. Adjusted net income1 for the first nine months of 2018 was $35 million, or $0.71 per diluted share, compared with an adjusted net loss of $173 million, or $4.07 per diluted share, for the same prior year period. The 2018 adjusted net income excluded $71 million of non-cash derivative losses, a net gain of $26 million on debt repurchases, a $4 million gain on asset divestitures and a net $12 million charge related to other unusual and infrequent items. The 2017 adjusted net loss excluded $38 million of non-cash derivative gains, $21 million of gains from asset divestitures, a $4 million net gain on debt repurchases and an $18 million charge from other unusual and infrequent items. Total daily production volumes averaged 131,000 BOE per day in the first nine months of 2018 compared with 130,000 BOE per day for the same period of 2017. This increase included a negative effect on production volumes from PSCs of 1,800 BOE per day. Excluding production from the Elk Hills acquisition and the effect of PSCs, the decline from the first nine months of 2017 to the first nine months of 2018 was 4 percent. This low decline reflects the gradual ramp up in capital investment beginning in late 2017. In the first nine months of 2018, realized crude oil prices, including the effect of settled hedges, increased $14.11 per barrel to $63.53 per barrel from $49.42 per barrel for the same prior year period. Settled hedges reduced 2018 realized crude oil prices by $8.00 per barrel compared with an increase of $0.66 per barrel for the same period of 2017. Realized NGL prices increased 32 percent to $43.71 from $33.00 per barrel in the first nine months of 2017. Realized natural gas prices increased 3 percent to $2.73 per MCF compared with $2.64 per MCF for the comparable prior year period. Production costs for the first nine months of 2018 were $679 million, or $18.98 per BOE, compared to $649 million, or $18.31 per BOE, for the same period in 2017. The Elk Hills acquisition added $24 million to the first nine months’ production costs and the increase in equity compensation expense added $8 million, or $0.23 per BOE. Excluding these items, production costs were slightly lower in the current year compared to the prior year due to ongoing efficiency efforts. Per unit production costs, excluding the effect of PSC contracts, were $17.48 and $17.21 per BOE for the first nine months of 2018 and 2017, respectively. G&A expenses were $234 million and $183 million for the first nine months of 2018 and 2017, respectively, with the difference primarily related to increased equity compensation expense resulting from the Company’s higher stock price and additional G&A expense as a result of the Elk Hills acquisition. Taxes other than on income of $120 million for the first nine months of 2018 were $17 million higher than the same period of 2017 primarily due to higher property taxes as a result of commodity price increases. Exploration expense of $18 million for the first nine months of 2018 was $1 million higher than the comparable year period of 2017. Capital investment in the first nine months of 2018 totaled $467 million, excluding JV capital, of which $363 million was directed to drilling and capital workovers. 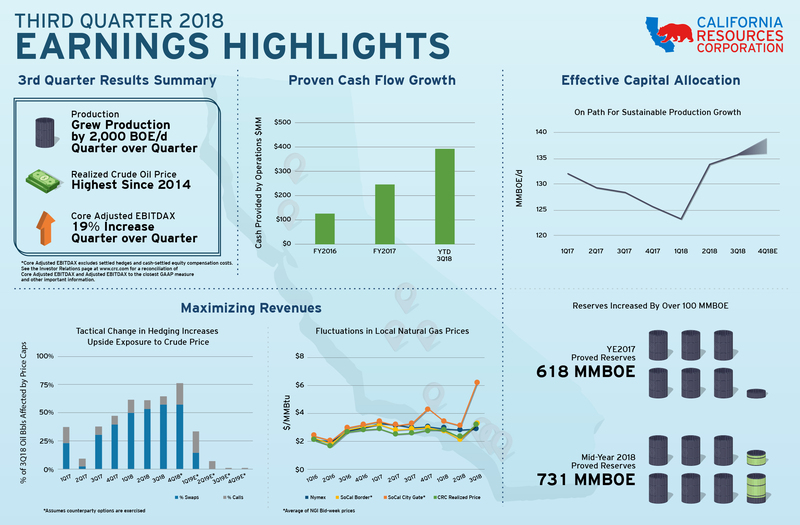 Cash provided by operating activities for the first nine months of 2018 was $393 million and free cash flow, excluding BSP funded capital of $37 million, was $(74) million. Excluding changes in working capital, which predominantly relate to greenhouse gas payments for prior years’ activities, free cash flow would have been $17 million. CRC operated an average of 10 drilling rigs during the third quarter of 2018 with two rigs focused on steamfloods, four on waterfloods, two on conventional primary production, one on unconventional production and one on exploration. CRC drilled 94 development wells and one exploration well with CRC and JV capital (43 steamflood, 25 waterflood, 18 primary and 9 unconventional). Steamfloods and waterfloods have different production profiles and longer response times than typical conventional wells and, as a result, the full production contribution may not be experienced in the same period that the well is drilled. In the San Joaquin basin, CRC operated seven rigs and produced approximately 99,000 BOE per day in the third quarter of 2018. The Los Angeles basin operated three rigs directed toward waterflood projects and contributed 26,000 BOE per day of production in the third quarter of 2018. The Ventura basin produced 6,000 BOE per day and the Sacramento basin produced 5,000 BOE per day. Neither the Ventura nor Sacramento basin had active drilling programs in the third quarter of 2018. CRC increased its 2018 capital program to a range of $720 million to $750 million, which includes approximately $100 million of JV capital. This increase from the previously stated range of $650 million to $700 million is intended to build on the momentum created in the first nine months of 2018. The updated program reflects management’s strategy to align the capital program with stronger expected cash flows from commodity price improvements and increased production from the Elk Hills acquisition. The additional capital will sustain current workover and facility activity through the fourth quarter of 2018. CRC continues to deliver on its commitment to strengthen the balance sheet. In the third quarter of 2018, CRC repurchased a total of $32 million in aggregate principal amount of the Company’s outstanding debt for $30 million in cash. Through the first nine months of 2018, CRC repurchased a total of $177 million in aggregate principal amount of the Company’s outstanding debt for $149 million in cash. The majority of CRC’s debt repurchases focused on the Company’s Second Lien Notes. Effective October 2018, CRC’s borrowing base under its 2014 Credit Agreement was reaffirmed at $2.3 billion. CRC’s mid-year proved reserves totaled 731 MMBOE, up from 618 MMBOE at year-end 2017. Excluding positive price revisions and additions related to the Elk Hills acquisition, the Company organically replaced 96% of proved reserves. This strong organic reserve replacement ratio (RRR) was achieved with well executed capital programs in Buena Vista, South Valley, Huntington Beach and Long Beach. Approximately 23 MMBOE of additions were related to transfers, revisions, extensions and discoveries and improved recovery. The Elk Hills acquisition added 63 MMBOE of proved reserves, in line with the estimate stated at the time of acquisition. CRC continues to opportunistically seek hedging transactions to protect its cash flow, operating margins and capital program while maintaining adequate liquidity. For the first and second quarters of 2019, CRC has protected the downside price risk of approximately 47,000 and 42,000 barrels per day at approximately $65.35 Brent and $68.91 Brent per barrel, respectively. In the third and fourth quarters of 2019, the Company protected the downside price risk of approximately 42,000 and 37,000 barrels per day at approximately $72.18 and $74.56 Brent per barrel, respectively. Except for a small portion primarily in the first quarter of 2019, the 2019 hedges do not contain caps, thereby providing upside to oil price movements. See Attachment 8 for more details. 1 See Attachment 3 for explanations of how CRC calculates and uses the non-GAAP measures of adjusted EBITDAX, core adjusted EBITDAX, adjusted EBITDAX margin, free cash flow, production costs (excluding the effects of PSC-type contracts) and adjusted net income (loss), and for reconciliations of the foregoing to their nearest GAAP measure as applicable. To participate in today’s conference call scheduled for 5:00 P.M. Eastern Daylight Time, either dial (877) 328-5505 (International calls please dial +1 (412) 317-5421) or access via webcast at www.crc.com, fifteen minutes prior to the scheduled start time to register. Participants may also pre-register for the conference call at http://dpregister.com/10124828. A digital replay of the conference call will be archived for approximately 30 days and supplemental slides for the conference call will be available online in the Investor Relations section of www.crc.com. California Resources Corporation is the largest oil and natural gas exploration and production company in California on a gross-operated basis. The Company operates its world-class resource base exclusively within the State of California, applying complementary and integrated infrastructure to gather, process and market its production. Using advanced technology, California Resources Corporation focuses on safely and responsibly supplying affordable energy for California by Californians. factors discussed in “Risk Factors” in our Annual Report on Form 10-K available on our website at crc.com. Words such as “anticipate,” “believe,” “continue,” “could,” “estimate,” “expect,” “goal,” “intend,” “likely,” “may,” “might,” “plan,” “potential,” “project,” “seek,” “should,” “target, “will” or “would” and similar words that reflect the prospective nature of events or outcomes typically identify forward-looking statements. Any forward-looking statement speaks only as of the date on which such statement is made and we undertake no obligation to correct or update any forward-looking statement, whether as a result of new information, future events or otherwise, except as required by applicable law. (a) We adopted the new revenue recognition standard on January 1, 2018 which required certain sales-related costs to be reported as expense as opposed to being netted against revenue. The adoption of this standard does not affect net income. Results for reporting periods beginning after January 1, 2018 are presented under the new accounting standard while prior periods are not adjusted and continue to be reported under accounting standards in effect for the prior periods. Under prior accounting standards, for the three and nine months ended September 30, 2018, oil and gas sales would have been $695 million and $1,915 million, respectively, other revenue would have been $177 million and $242 million, respectively, and other expenses, net would have been $139 million and $171 million, respectively. (b) Weighted-average common shares outstanding for adjusted net income (loss) per share – diluted were 47.6 million.